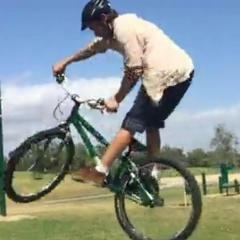 I'm starting to learn some basic trials moves coming over from a mountain bike background. I've realised that in general I ride with my left foot forward doing stuff like trackstands, bunnyhops and trying to learn manuals. But as soon as I need a pedal input like trying to do pedal kicks I want my right foot forward. This feels all wrong at times but trying to do anything with the other foot forward feels really awkward. Will I get away with it as i learn more stuff or do I need to force myself to change to get used to having the same foot forward for everything? that's pretty normal, I think most people go though that stage, just carry on and you'll naturally find that you'll start to use the same foot for most moves, sounds like it'll end up being your left foot. Good friend I used to compete with, after 7 years of riding.. if he both wheel hopped around on rocks/ balanced he had to have his left foot forward- then when he did anything with a pedal kick- sidehop/gap/etc he had to be right food forward. Never known anyone who did this... you’ll figure it out eventually, just pay attention to which one naturally stays forward while you are coasting. with that said I’ve been spending the last three years addressing my bodies imbalance from using _only_ left for forward for thousands of hours of riding over 20 years. Takes it’s toll.